Finally got the third of my Crystal Elf Empire Garde painted up. Another spearman that was almost finished a couple of weeks back but time and inclination weren’t on my side when it came to getting the last little bit done. A bit of spare time this weekend though was put to good use and I got it all finished up. Just one more model to paint from this initial batch of elves, a sorceress that I’ve already started base coating. I’ve got plenty more elves I can add later too. I’ve finally got around to painting something for myself again, another elf from Alternative Armies. This is a Garde officer to go with the spear armed elf from the previous post. It took far longer to get done than planned. I had hoped to have it done by about the end of December but as tends to happen each year around Christmas I crashed and burned and could not get into painting anything. I made a slight alteration to the model as the sword blade is rather short, the tip being held in his hand in the original sculpt. It just didn’t seem offensive enough for my liking so I took a spare metal spear shaft, flattened and shaped it and pinned it into his hand. A pretty simple conversion but I think it makes a big difference. Another quick post of a single figure here. Hope these meagre posts aren’t too dull (although the view count suggests they are). 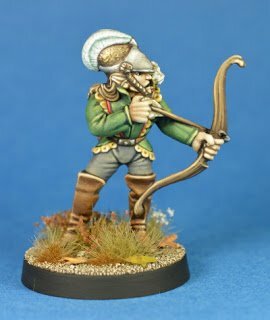 Anyway, I’m still very much keen on these Alternative Armies elves and this is a Garde spearman. Love the uniforms of these models. I ended up using quite a few different colours on this, the blue and yellow for the coat, green trim, red tassles and of course that bloody great pinky purple feather. All potentially could lead to a gawdy mess but I think keeping them quite muted has made it all work. 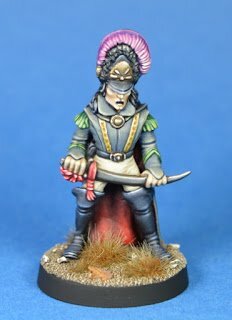 I’ve got a rather nice officer that I plan to do next, then there’s another spearman variant but I might get sidetracked by a sorceress before that. 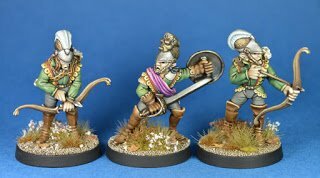 More recently I acquired additional command models for these Garde so have a musician, standard bearer and a sergeant for sometime in the future. So much I want to paint and just not really the time to do it all. A familiar story I’m sure. A quick post here as I add another painted figure to my very slowly growing warband of Alternative Armies Crystal Elf Empire elves. This one is a swordsman, duellist type, a rather haughty looking noble. My first thoughts on a potential colour scheme weren’t that different from what I ended up doing but the more I looked at the model the more I kept thinking ‘Melnibonean‘ and ‘Elric‘. Eventually I couldn’t see the model as anything but Elric so I changed my plans and went with the ghostly pale complexion and milk white hair of the albino. I’ve been slowly painting up a few more of my Alternative Armies Crystal Elf Empire models. Another two dismounted dragoons, one being an officer. At some point it would be nice to get three mounted versions too but for now I’m more focused on infantry types. Anyone who’s seen my earlier post where I reviewed the small batch of models I’ve got will know there’s a couple of characters to be done and a triplet of garde infantry. I have acquired a few additional models since though so there are even more pieces vying for my painting time. Most notably some fantastic duellists that are currently not listed in AA’s webstore and the Crown Prince Mordred himself. Wish I had more time! This was a small commission that I couldn’t resist posting about because I really like all things genestealer. My own history with these chitinous, egg laying, hybrid making nasties goes all the way back to the release of the 1st edition of Space Hulk. Loved the idea of covens and cults as shown in the army lists in White Dwarf at the time as well. I had a couple of the metal hybrids and the running patriarch but that was it outside of the numerous plastics. Much later on I picked up the seated patriarch somewhere online for a real bargain by todays standards and then some years back I went on a little collecting spree and grabbed a handful of hybrids and more metal purestrains than I really should have. Of course my genestealers are sitting unpainted and gathering dust like most of my ‘projects’. Adding to that are the new generation of models acquired through 3rd edition Space Hulk and Deathwatch Overkill. For this commission I was asked to follow the original studio paint jobs. I tweaked a few things as the original colour schemes are a little garish in retrospect but I think these a pretty true to those classic paint jobs. The last time I painted a genestealer I was a teenager and it was the early 90’s. Very few of my old paint jobs exist but there are a couple of plastic genestealers kicking around from those early days and I took a quick snap of three generations of painting. On the left is one of my earliest attempts. Base coats, ink washes and drybrushing as prescribed in the pages of White Dwarf at the time. This could be from 1989, I forget when exactly I started painting these models. It would have originally been based on a metal gauze topped slotta for Space Hulk. The middle model is from anywhere between 1990 and 1993 I reckon. This is where I discovered layering thanks to picking up a copy of Heroes for Wargames whilst on holiday. A much more sophisticated finish although still showing my lack of experience. 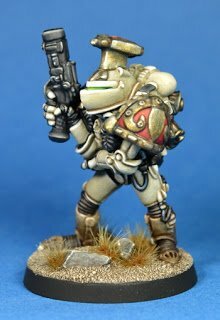 This may have been a repaint of one of the wash and drybrush models. Of course the one on the right is modern day with a fair bit more experience and ability behind it. The big guy, the patriarch and magus advisor. A lot of work went into this as might be expected. A little daunting at first, especially the throne but once the base coats were on it really wasn’t as scary as first thought. A trio of magus’s, magi, mag… whatever. 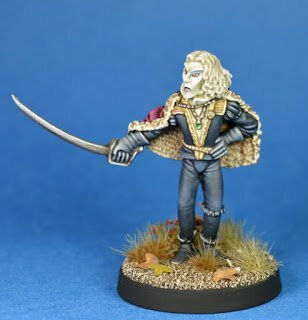 I have to two Jes Goodwin models but not the Bob Olley sculpt. Always though there were three Bob Olley sculpts but it seems there are only two (the other having a staff)! And finally the purestrains, the worlds most awkward models to photograph (bloody arms in the way!). That’s it, next post should be on something I’ve painted for myself all being well. These days my blog is mostly for my own projects but every now and again I think it’s worth posting some of the commission work I do, especially when in this case there’s a little plug for Crooked Dice’s latest Kickstarter. Not everybody’s a Kickstarter fan so if that’s the case just enjoy the pictures (hopefully). 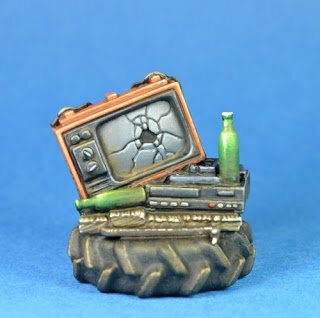 7TV Apocalypse is the new themed game box from Crooked Dice and the Kickstarter has a bunch of models available representing all sorts of familiar characters. I’ve painted a good number of the new models and here are some of them. Just a quick post here. Wanted to show the first of my Alternative Armies Crystal Elf Empire models painted up. This is one of the dragoons and I’m quite chuffed with how it’s turned out. Got another two to do. Being dragoons I’m tempted to get the mounted versions too but I should probably focus on getting the handful of models I already have painted. 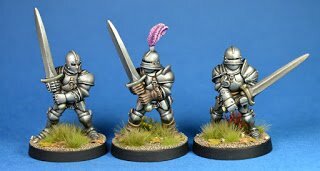 A quick post to show a couple of old Grenadier Miniatures foot knights that I recently painted up. The one on the right was painted a while back, possibly over a year ago at this point. 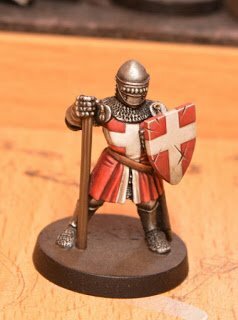 I’ve had four other knights base coated and gathering dust ever since. The other week I decided it was time to change that sorry state of affairs and get another painted. That rapidly turned into me getting two done thanks to these being pretty straight forward models. I originally bought these back in the early 90’s on the strength of a review in Games Master International magazine. They made up a full unit of 15 knights and were a part of my poorly thought out Bretonnian army. It’s really nice to see these few given a new lease of life. Two more waiting in the wings but for now I have other things I want to work on. I recently acquired a handful of Crystal Elf Empire models from Alternative Armies and thought they deserved a little review. I remember these models being released in 1991 and being advertised and reviewed in Games Master International. Here’s ye olde full page ad in GMI issue 15 from October 1991, the last issue of the magazine sadly. 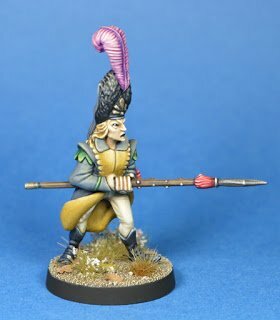 These models stood out at the time because they had a Napoleonic influence to their design, not to be confused with AA’s Flintloque range though which are fantasy Nappys. The Crystal Elves certainly stood out next to the competition and I rather liked them although I never bought any given my limited pocket money. Too many toys, not enough money. Completely forgot about them as time went by until a couple of years ago when I re-collected all the old issues of GMI and saw the ads again. Thankfully Alternative Armies still have them in production and the range features more models than I was aware of. Moving onto the models I’ve actually got here it’s just a small selection that I’m going to make into a Frostgrave inspired warband. First up is a set of Garde Infantry. Two spearmen (spearelves?) and an officer. I was actually pleasantly surprised by the size of them and how much heft they have. From the pictures I thought they might be quite slender and with older figure ranges there’s always the possibility that they might be on the smaller side of 28mm. They’re very much 28mm from foot to eye and are actually a bit bigger than some of the competition at the time. All very satisfying. Lovely clean sculpts, nice clear detail and the officer is just a fantastic looking figure. My only criticism is that his sword is a little short so I might try and rectify that before painting him. The faces are quite caricatured but I love that and it gives them a pompous arrogance that sits so well with the finery of their uniforms. Next is a set of dismounted Dragoons. Being dragoons they have mounted versions but I was keen to get the foot versions. Slightly more practical uniforms here than on the Garde Infantry, much more suited to skirmishing. Their helmets are a nice touch of finery though and the officer with sword and shield certainly looks the part. I really like the poses of these models. I’d be tempted to extend the length of their quivers a little though. I think casting limitations may have lead to the rather short length. Finally there’s an elf warrior and a sorceress. I really like the elf warrior, the pose and clothing look great. He’s a little less Napoleonic inspired I’d say but fits in really well. The face makes it for me though. There’s a hint of cruelty there along with the arrogance which just screams Melnibonean. The sorceress also has that similar look to her face and is one of the models from the range that is a more traditional fantasy looking elf. There are some subtle patterns on her robes that will need careful painting to make the most of. She comes with a staff that I’d say is optional as she looks great as is. If fitting the staff though the hands aren’t quite designed for it so I’d be inclined to cut the thumb off and add a new one with putty to make the hand actually grasp it properly. And a few pics to show them alongside a few other models from the day to see how they size up. Here’s a 1980’s Citadel elf and an early 90’s Bretonnian foot knight. A Citadel Empire hero from around 1992 and a Grenadier foot knight from the early 90’s. 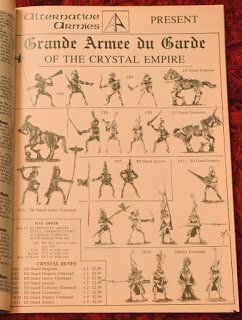 The whole Crystal Elf Empire range has 20 odd packs of models, just under half are the Napoleonic inspired types and the rest are more traditional fantasy elves which look like they mix together pretty well to be honest. What’s rather useful is that you can also buy all the models individually so you can build up full units of identical models quite easily. Prices are pretty good in this day and age working out at £2 a figure for most infantry (the sorceress is £3) and cavalry are £3 or £4 each depending on the model. There are also discounts for multiple pack purchases. Well worth checking out. 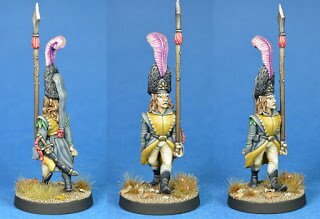 Bretonnian standard bearer – revisited! I must have painted him a couple of years ago as part of my Bretonnian foot knight command but I never got around to painting the banner. I hate painting banners as I find it awkward in comparison to painting figures. Anyway, having decided to move onto getting some more fantasy stuff painted I thought I’d better try and finish this off and fill that empty slot in my unit. Just base coats at the moment but thought I’d show how I’ve got a nice clean edge to the quarters. I use Scotch Magic Tape to mask the area. It’s easy to tear by hand and isn’t horribly sticky which means it’s great for masking. I made sure to press the tape down hard along the edge to be painted to avoid it bleeding under. Got to make sure the painted areas are good and dry though as they can still lift off when removing the tape. It makes the process quite slow going and only once did I have to retouch a small area that peeled after not following my own advice. Make sure the paint isn’t too watery to also help reduce the chance of it bleeding through but don’t apply it too thickly either or you’ll leave a ridge when the tape comes off. I’ll shape the banner before I highlight it. It’s a piece of sheet metal (tomato puree tube) and the paint copes perfectly well with the flexing. Then I’ll have to print off some decals for the lions and go through all that rigmarole. This might all get done fairly quickly or it could take a while, I’ve no idea but I am going to get it finished this time. I’m slowly progressing with my Bretonnian foot knight standard bearer. I needed a little decoration to pop on the end of the flag pole so I decided to replicate the fleur-de-lis that I used on another Bretonnian standard. This is the green stuff press mould that I made a few years ago. The original part was cut from a 5th edition Bretonnian standard. I used a mix of green stuff and Milliput white in the mould. A little cooking oil stops the putty sticking. Once dry pop it out of the mould and clean up the flash. It’s not a bad reproduction. If I’d used just Milliput I could have filed the edges a bit sharper but it’ll look fine once painted up. There’s a quick snap of a little of the painting I’ve been doing on the flag too. Unfortunately the highlighting and shading that should give some added shape to the flag is completely washed out in the photo. But it’s evidence that I’ve not dumped it in favour of doing something easier again. Still need to work on the front of the flag before printing off some lion rampant decals. Quick and lazy post here, mostly copy/pasted from my Facebook page. Found this part finished and stuffed in a tray of models recently. It’s an Alternative Armies/Ion Age Retained Knight Noble in 28mm. I started it perhaps a couple of years ago, wasn’t entirely happy with it and just put it to one side. Decided it was time to give him a new lease of life and get it finished off. I repainted a few things and retouched some scratches and chips.This model is a bit bigger than the regular knights and a fair lump of metal in comparison to a space marine of pretty much the same era (yeah, I know MK7 marine armour was in by then). I remember these models first being released in the very early 90’s when they were sold as Free Company Crusaders. Loved the look of the armour but never got around to buying any until I bagged a bunch on Ebay a few years back. At some point I’d like to paint up a full squad of these but I’ve got plans to paint more fantasy stuff so that will have to wait.